One could almost compare La Rambla with a large artery, pumping large amounts of people around the clock up and down between the centre Placa Catalunya and the harbor. The Spanish poet Federico Garcia Lorca is told to have said this about La Rambla, "It is the only street in the world that I wish never ended." La Rambla, also known as Las Ramblas, starts at Plaza Catalunya and ends at the Columbus monument in Port Vell at the Port of Barcelona. La Rambla is a very nice and wide promenade lined with trees and hundreds of restaurants, bars, shops, various booths and also street performers. 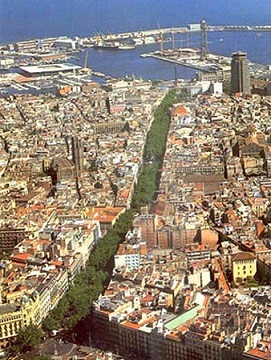 If you haven't walked down the Rambla, you can hardly say you've even been to Barcelona.